Fabio Fernandes: Even though I perceive it as somehow necessary (so we can get some kind of "order," an underlying principle of communication), I confess I feel sometimes sad at this, because there's so much my native language could convey. Now, I understand only a few people would be able to read Portuguese, but I've been trying more and more to write stories featuring a kind of "mishmash" language, a dialect of sorts that still had English as its axis but around which many neo-Latin languages revolve. Right now I'm writing a cycle of stories in which one of these languages, Mistureba, is featured. It's a bit like Papiamento, but mixed with English. It's not an easy task—I've been dealing with it for almost two years now. I'm a sucker for languages anyway, so I figured I would give myself the time to construct it. Benjanun Sriduangkaew: Oh, that's really interesting! I've seen Lavie touch on similar issues in his story The Long Road to the Deep North, where a future Earth is a lively mix of cultures and languages. Rather than everyone speaking a single lingua franca, they blend and invent dialects or languages that often have nothing to do with English. Fabio Fernandes: Yes, that story is really interesting. I seem to remember he did something similar in his novella Cloud Permutations [PS Publishing, 2010], only in that case it wasn't a constructed language, but a kind of back-and-forth between English and the language of Vanuatu (where Lavie lived for a while a few years ago). I love reading these stories. Benjanun Sriduangkaew: I had a conversation on Twitter with Nalo Hopkinson, Charles Tan, John Chu, and Vajra Chandrasekera jointly and separately where we considered the language in which we write. Nalo often writes in Caribbean vernaculars. Charles mentioned cultures that have made English their own and I can think of a few: Singlish, Hinglish. My home country doesn't do this, but could anyone offer insight into this idea? Sofia Samatar: I want to respond to the first point you raised, Benjanun—that some reviewers see an English-language anthology of postcolonial-themed fiction as somehow "ironic." I don't see anything ironic about it. English is a global language because of colonialism. How is it ironic to address postcolonial issues in English—a language of oppression and resistance, of loss and survival—a postcolonial language? It seems to me that by criticizing the use of English for the anthology, these reviewers are pointing toward a lack of authenticity among the writers. They want some sort of "real" postcolonial expression, and to them, the "real thing" can't be expressed in English. Of course, as Fabio says, there is no one-to-one correspondence between languages, and so there will always be things a language other than English could express more fully, carrying all kinds of connotations missing from English, carrying scents and varieties of weather—in fact, carrying worlds. But the existence of these worlds does not erase the world which English expresses with terrible accuracy: a postcolonial world in which many people (myself among them) who wish desperately that they could write in another language, in their "own" language, cannot do it. Gabriel Murray: I absolutely agree with Sofia on this and the rest of her point about "authenticity": It seems to me that by criticizing the use of English for the anthology, these reviewers are pointing toward a lack of authenticity among the writers. They want some sort of "real" postcolonial expression, and to them, the "real thing" can't be expressed in English. I was thinking the same thing about the criticism—the thing here is, this isn't (just) an anthology of international SFF, it's an anthology of postcolonial SFF. That's both a political stance and a historical perspective. The reality is that we—everyone, and we specifically meaning the contributors to this book—do live in a postcolonial world, and for many, not even post—the diffusion of English as a lingua franca (and the phrase "lingua franca" still being in common use to describe a shared language of trade, for that matter) is the result of colonialism. I'm not sure what the irony is there. I suppose I find it more ironic when monolingual Anglophone people voice this criticism. There's also a question of accessibility and distribution. The only language all of the contributors have in common is English; this is also a result of Western colonialism, obviously. And I can't speak for Fabio and Djibril here, but I think part of the intended audience for We See a Different Frontier is people who aren't already aware of these issues, who don't, in fact, see a different frontier themselves: frankly, white Westerners. I guess I think a better question to ask than "why doesn't We See a Different Frontier have stories in other languages than English" is "why don't more SFF anthologies at all have stories in other languages than English?" I suppose my perspective here is certainly diasporic—I'm a second-generation mixed-race Asian-American, by which I mean my mother and stepfather and their families are Korean from South Korea but I was born in the United States. The existence of diasporas like the one I belong to is also postcolonial, though. I wasn't brought up to speak much Korean, certainly not enough to write fiction well in, because my family—understandably—didn't see it as a skill that would get me far in life compared to studying and excelling just in English. That's the result of colonialism too. I guess I think the question lacks perspective. Dinesh Rao: Though I grew up sort of trilingual, English has always been the dominant one. Mostly because the school I went to had a rule that no one was allowed to speak any other language on the premises. As a kid I embraced this attitude, so proud of my ability to communicate, to write in English, and it was only many years later that I realised what damage this colonialist thinking had done. I couldn't write a story in Kannada if I tried, though I could possibly tell one. So instead I do write in English, but I am now consciously making an effort to translate Indian sensibilities into my fiction. Which itself was not an automatic or an easy task; English and English language dominance meant that the default names in my very early stories were all western, the plot was western. DeepaD put it so much more eloquently in her post "I didn't dream of dragons." So yes, English is dominant; one must make peace with that, but also this means that it can reach an audience that has a chance of looking at the world from a very different point of view. Benjanun Sriduangkaew: I don't know if it still shows (it probably does) but I haven't always been fluent, coming to grips with English long after I earned my bachelor's degree some twelve years ago. It was thoroughly embarrassing just to speak with any foreigner—a lot of stumbling. My goal was then to improve my English so I wouldn't make a fool of myself, but I didn't imagine it would let me connect with brilliant writers and participate in a discussion like this one. . . so having a language in common can facilitate postcolonial collaboration and doesn't contradict the purposes of the anthology at all. It's making use of the medium, so to say, or the tools available to us. My perspective on attaining fluency has changed a lot. Aliette de Bodard: I was raised speaking French with a smidgeon of English (my English didn't actually get decent until we moved to the UK for a bit, and it progressed exponentially after I started writing and interacting with people online). Like Gabriel, my parents made the choice early on that Vietnamese, my maternal family's mother tongue, wasn't worth learning (colonialism, plus I think a strong sense that for my mom, there would be no coming back to Vietnam in her lifetime—an impression which was thankfully proved wrong). It took me years to get to the point of not copying Western fantasy in my work; I think because all I read was Western—for which we have the hegemony to thank. Rochita Loenen-Ruiz: It's interesting to observe who levels this kind of criticism at this kind of work. It seems to me that the origin of such a criticism is a lack of awareness of the historical, political, and social effects of colonialism. I find myself thinking of this quote by Junot Diaz: "Motherfuckers will read a book that's one third elvish, but put two sentences in Spanish and they [white people] think we're taking over." To me, criticisms regarding use of language indicate a need in the critic to put the work "in its place." I find it difficult to see what other purpose it serves except to suppress or to rob the work of value by saying: "Oh but it's not authentic enough because. . ."
To demand that works be written in the original language, and to fail to acknowledge the dominance of English tells me that this demand originates from a place of unquestioned privilege. The person saying that fails to understand how the colonized have been compelled to abandon the native tongue in order for our stories to be heard. Let's not even start on the existing problem of translations and the fact that so many readers are monolingual. In my own work, I do try to embed words/phrases particular to us—like writing code into the story that would tell a person from the region I'm working in. Those things which the Western eye skims over, but which are like electric signals to the reader who knows or is connected to that particular place. J.Y. Yang: Recently I was on a panel in Singapore featuring Jeffrey Lim (a local writer) and Ken Liu (who was there as a guest). During the Q&A one of the audience members asked, "How has colonialism affected you as a writer?" I answered: "Well, for one thing, I'm speaking to you in English. . ." My parents were born British subjects and my first words as a baby were in English—to suggest that I should be writing in some language other than English because I write postcolonial themes seems somehow bizarre to me. Not knocking it—I actually wish I could write in more languages than one! But it's just not a possibility for me. So I agree wholeheartedly with the sentiments expressed by Sofia and above. I am nominally bilingual by state fiat—we have to take a "Mother Tongue" in school which is assigned (ironically) by your father's ethnicity (a cop to Singapore's "multiracial society," which is a whole other sociological discussion. . .). Twelve years of instruction in Mandarin Chinese and you'd think I'd be fluent, but I am barely conversationally functional in the language, much less able to craft fiction in it. I grew up speaking English at home because my dad couldn't speak Mandarin (even though my mum's English was quite poor at that time). I like that people have already mentioned Singlish! Which is the local pidgin and relates closely to Malaysian English (they call it Manglish I think?). There's actually a strong class aspect to this, as Singlish is considered a low-prestige language and the ability to code-switch between Singlish and "standard" English is taken as a marker of middle/upper-class-ness (or as we call it, "being atas," atas meaning "upstairs" in Malay). To be honest, I find it a bit of a hairball when I write fiction with Singaporean protagonists. Even in third person I have difficulty reconciling what's expected in standard, "literary" English with the speech and thought patterns of someone who natively speaks Singlish—and a large majority of Singaporeans, to different extents, do. I have no qualms writing Singlish speech patterns into dialogue, but narration always throws me for a loop. On one hand, style matters a lot in what we consider "good" writing—the use of language as a tool—yet on the other hand every time I write a scene where my middle-class Singaporean protagonist is looking out over the city, and I describe it in looping, florid bursts of language, there's a scoldy little voice in my head muttering, "Wow, this person sounds like a pretentious twit." Wah lao, where got so atas until like that one. You know? I'm sure there's a balance to be struck somewhere, or I'll eventually learn how to shut that scoldy little voice up. But it hasn't happened yet. Ongoing struggle! Sofia Samatar: This reminds me of that great Junot Díaz quote Rochita mentioned above. Think of a book like A Clockwork Orange . Invented language seems exciting and oddly accessible to people, but an actual language sends everybody running. I think that's ridiculous. I'd love to read a story with Singlish or Singlish-inflected narration. Not saying it wouldn't be challenging, and there would be tons for you as a writer to think about if you wanted to reach someone like me, but there would also be huge rewards in terms of what you could convey and how you could push the language (literary language in general; the language of SF in particular). Rochita Loenen-Ruiz: I find myself wondering why it would be any more difficult for readers to access stories written in Singlish or any other appropriations of English when even in mainstream literature we see the work of writers like William Faulkner praised very highly. What really lies behind this resistance to these appropriations of the English language? Personally, I find works that appropriate language and twist and turn them to the author's will to be more interesting. I see writing as being similar to painting in terms of how we take words and use them—bend them to our will in order to bring the shape that we want to see on the page. This exploration of language as related to decolonization is something that brings us work that is different. Aliette de Bodard: The question of the various Englishes and their value is something that's been on my mind lately; and there's definitely a hierarchy of "acceptable" English vs. "dialects" that are not accepted. It's very much a system that enables Western Anglophones to remain at the apex of the English pyramid by speaking "proper" English as natives, and devaluing everyone else for failing to speak that same language. I would love to see novels in Singlish/Manglish/other appropriations of English. Benjanun Sriduangkaew: I like to think of short stories as questions—asking, answering, or both. Do you feel this idea is pertinent to We See a Different Frontier, and if so, do you think offering an answer or solution to the questions asked by your stories is necessary? Rochita Loenen-Ruiz: I'm not so sure about asking and answering as in carrying on a conversation with existing work. I also don't feel that it's necessary to provide an answer or solution to the question asked. I do feel that what the anthology does is present readers with a clear interrogation of the beloved tropes. It's like challenging existing canons where we see the glorification of colonization often through the eyes of the colonizer. What happens when the tables are turned around? These stories are us presenting variations of "what ifs" from the perspectives of those who were once colonized. Aliette de Bodard: I tend to think like Rochita—stories are a piece of a conversation, whether with existing work in the SFF genre, or with other things like real life events, etc. Some of them can be about questions, whether asking or answering them; but I don't think it's a sine qua non condition for having a short story! When they are questions, as far as I'm concerned, offering an answer or solution is not necessary—it can work swimmingly well, or it can be terribly normative. I don't think stories should be tidy or wrap up with a bow—and, to some extent, I think the Western model of plot structure is problematic because it's too orderly and sometimes entirely too mechanical, whereas life is seldom this way! Also, on issues of colonialism and post colonialism—I wish the answers were simple, but I fear that the inheritance of colonialism is a complex tangle, linguistically (as June said, the question of why some people speak English as a first language is a double-edged sword), historically (the narratives of attaining independence and maintaining it are seldom tidy, and often conflicting), culturally (should we decolonise? Can we decolonise, when the culture of the coloniser has so thoroughly changed our own? ), etc. So, as a writer, I'm not even sure I'd be comfortable providing answers! For me, the idea behind We See a Different Frontier is that it puts difference out there—that the "frontier" isn't the idealised one of the Conquest of the West mythos, but a boundary separating two equally real and equally valued people; that the vast tracts of space are not there for the taking, and not the exclusive province of Westerners; not the subject of colonisation rhetorics (or, if they are, that there will be a reflexion on its tremendous costs). Rochita put it best in the closing paragraphs of one of her "Movements" columns in this magazine: the "great unexplored" is the privilege of the dominant culture; while "We See a Different Frontier" is a statement that "the colonized have their own stories, that in the narratives of alien worlds the hero of the popular trope is the invader, the enemy, and the oppressor." Sofia Samatar: The poet Lyn Hejinian has said: "Closure is misanthropic." I love that. Aliette, what you say about the "Western model" of a tidy plot structure is very much to the point. I'd even narrow it down to Western SFF, because I don't see it nearly so much in literary fiction. I'd say short stories ask questions, sure, but in indirect ways, and they require indirect answers. The answer a reader gives to this anthology might be a widening of the eye. It might be a memory that comes to life when that reader reads something else, several years in the future. It might be a sudden urge to say something at a panel at an SF convention. Who knows? I suppose I see the anthology as a whole as more of a statement than a question. I agree with Rochita that it's an interrogation, a challenge. This anthology takes a position. It says: "We see a different frontier. 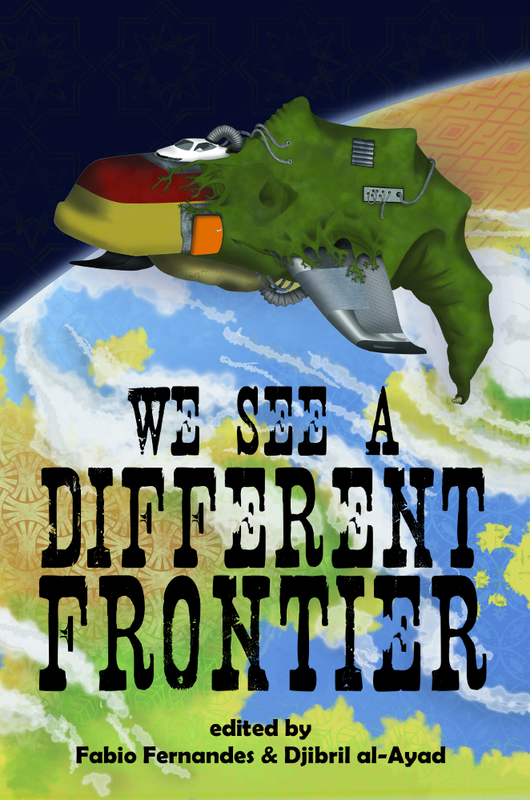 We reject the idea of the 'frontier' as we've seen it characterized in genre fiction. When you cross a frontier, with your boldness and weapons and independence and charm, remember that there is someone on the other side." Benjanun Sriduangkaew: Yes, interrogation's very much what I had in mind when I suggested the shape of stories as questions. And I agree that providing solutions is far from necessary or even expected! The subject of the anthology especially denies the comfort of answers, and while fiction that simply entertains has its place, fiction that goes out of the way to do the opposite—creating discomfort—is valuable in a different way. About what ifs: Lavie's story "Dark Continents" skirmishes with that rather literally, and also presents the difficulty of coming up with better alternative timelines even in the hands of those who can "edit" and "remix" history at will, a direct refusal of obvious or easy answers. Finally, would you like to recommend any author or title pertinent to concerns of language or postcolonialism? Sofia Samatar: I would love to! Rochita Loenen-Ruiz is a Filipino writer currently living in the Netherlands. Her work has been published both online and in print, in the Philippines as well as outside of it. She is a columnist for Strange Horizons , keeps a book blog at chieandweng.wordpress.com, has a website at rcloenenruiz.com, and is on Twitter as @rcloenenruiz. Aliette de Bodard is a half-French, half-Vietnamese living in Paris. Her Aztec noir trilogy Obsidian and Blood is published by Angry Robot, and her short fiction has been published in Clarkesworld , Interzone , and The Year's Best Science Fiction , garnering her a British Science Fiction Association Award, and Hugo and Nebula nominations. She blogs and geeks on food over at aliettedebodard.com. Fabio Fernandes lives in São Paulo, Brazil. He has stories published in Everyday Weirdness , StarShipSofaKaleidotrope , Steampunk Reloaded , and The Apex World Book of SF 2 . Two-time recipient of the Argos SF Award (Brazil), he co-edited the bilingual zine Terra Incognita in 2008, and has translated Neuromancer , Foundation , Snow Crash , and Boneshaker into Brazilian Portuguese. Gabriel Murray lives and works in New York, NY. His work has appeared in Ideomancer and Daily Science Fiction ; he reviews books and reads submissions for Strange Horizons . He can be found on Twitter at @orestesdrinking. Dinesh Rao, originally from India, lives in Mexico with his wife and daughter. His short stories have appeared in the World SF Blog and The Indian Journal of Science Fiction Studies . His blog is at pointsofdeparture.wordpress.com. J.Y. Yang was born, raised, and centred in Singapore, and has always been a teller of tales. Some of them have been published in Crossed Genres and Steampunk Revolution . She co-edited Ayam Curtain , an anthology of speculative micro-fiction written by Singapore-based authors. Publication of this article was made possible by a donation from Chrisy Calvin-Slusher. (Thanks, Chrisy!) To find out more about our funding model, or donate to the magazine, see the Support Us page.